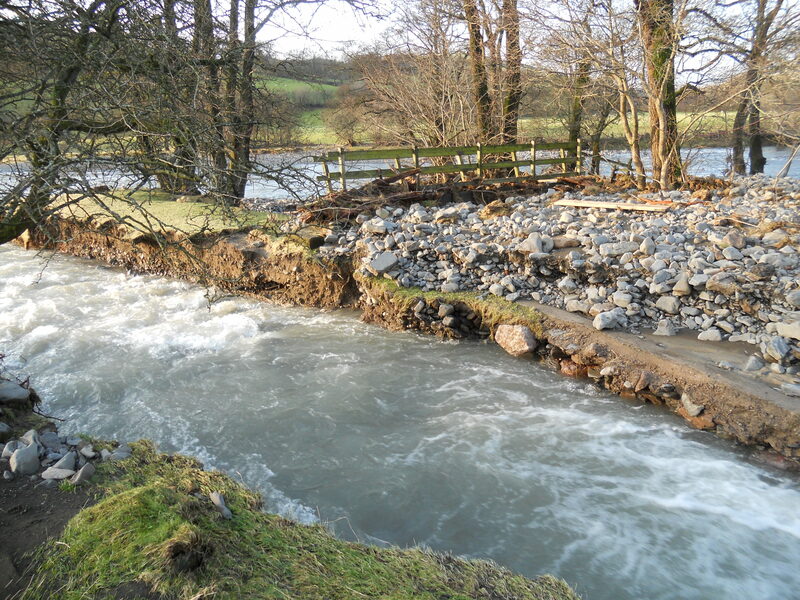 We have been informed on the 21st December by the Yorkshire Dales National Park Authority, that a substantial land slip has caused the Dales Way footpath to be closed near Brigg Flatts, just south of the footpaths exit onto the A683 Sedbergh to Kirkby Lonsdale road. This will take some time to rectify. Temporary closure notices have been posted and alternative footpaths marked. This entry was posted in Uncategorized on December 22, 2015 by Alex McManus (Footpaths). The involved Authorities, YDNPA and CCC continue to struggle to get on top of the problems caused within their area by the recent exceptional rainfall. Their first task has been to ascertain the the extent and location of the damage to their bridges and footpaths which is continuing. They warn that they will be restricted as to when they can start on permanent repair work due to various issues, including finance. The major problem reported concerning the Dales Way footpath, as reported below, can be solved by using existing public footpaths, which will be waymarked in due course. This bridge could be closed in the future. The present bridge was built in 2004 to replace the original which was destroyed in the Spring of that year, not so much by flood water, but by broken trees washed down in the current. The advice which we offered to our members then, is still relevant today. Do not search for a crossing by moving along the river banks. There is no footpath nor right of way. Approaching from the East, at the brow of the hill, instead of descending through a gateway [now metal] continue on the field track to the farm, passing Haveriggs on to Patton Bridge and the Dales Way footpath. This entry was posted in Uncategorized on December 12, 2015 by Alex McManus (Footpaths). The Yorkshire Dales National Park informed the Dales Way Association on the 8th December of damage to the footpath due to the recent storms. The most serious was at Chapel Beck, which flows into the river Lune, approximately 1 kilometer south of Crook of Lune bridge. Chapel beck has filled its original bed under the bridge with rubble and has created another channel across our footpath. In the immediate future crossing this new stream will be from wet to dangerous. Explorer Map OL19 Howgill Fells and Upper Eden Valley will be very useful. Cumbria County Council also issued a warning of a dangerous section south of Cowan Head 800 meters south of Bowston. The field next to the damaged footpath can be used. This entry was posted in Uncategorized on December 9, 2015 by Alex McManus (Footpaths).